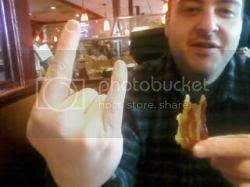 My bro sent me this pic of him and his bacon throwing the metal horns this morning. Rock! Smorkin' Smoking Breakfast Toys w/ Bacon! A Bacon Meatloaf Cross - Happy Easter! Three Skull Socks from THROX! Custom Skull & Bacon Postage!